Let’s show up with fierce hearts and with profound regard for ourselves and each other, our ancestors and future generations. To vote is to love. To vote is to respect ourselves and our own lives enough to show up and take a stand for what matters most deeply to us. In voting, we empower ourselves to send the message — both internally and to the world — that we care about what matters and that we can make a difference. Vote for the love of yourself. To vote is to love. 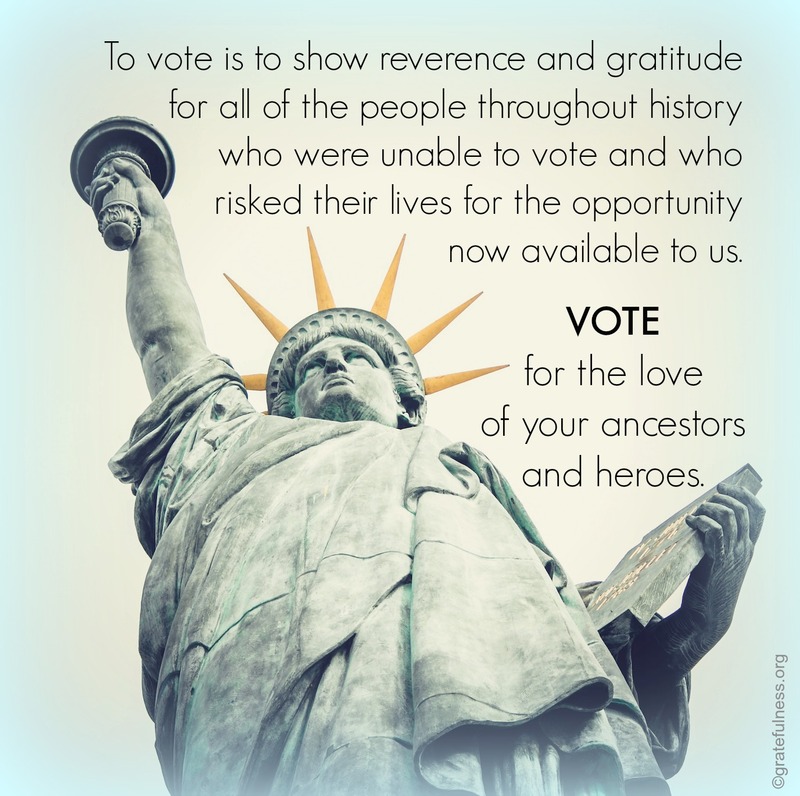 To vote is to show reverence and gratitude for all of the people throughout history who were unable to vote and who risked their lives for the opportunity now available to us. In voting, we bow down to the sacrifices made in the name of our privilege. Vote for the love of your ancestors and heroes. To vote is to love. To vote is to express respect for all of the disenfranchised people who still cannot cast their votes. In voting, we ally ourselves with all of the people in the United States and around the world relegated to the margins and unable to be counted. Vote for the love of those who cannot. To vote is to love. To vote is to represent the needs of the future — the children who will inherit our world and whose lives will be shaped by every choice we do and do not make. In voting, we take a stand for future generations. 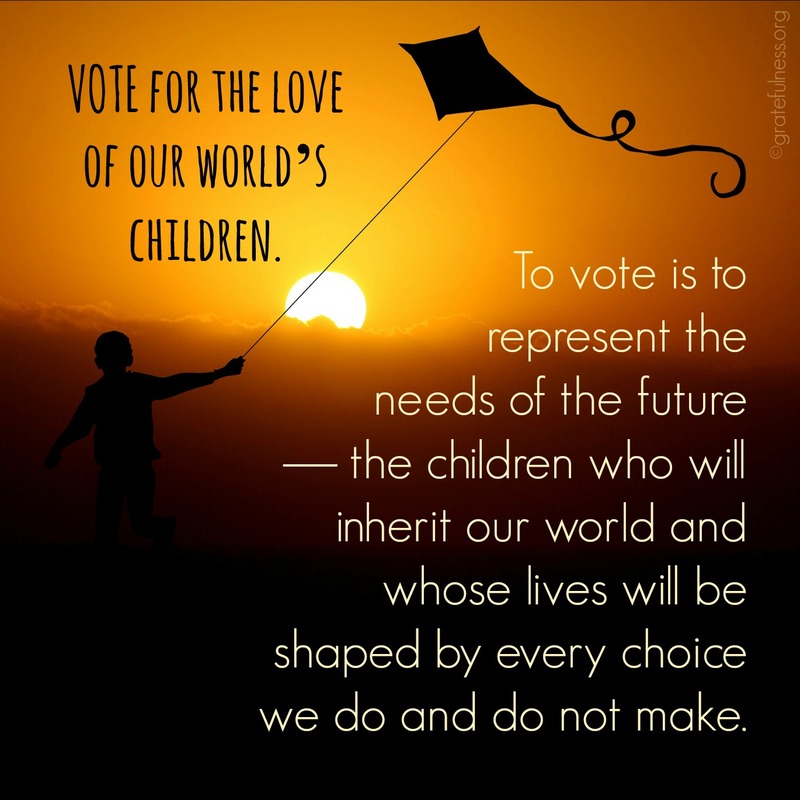 Vote for the love of our world’s children. To vote is to love. To vote is to advance the values to which we are most devoted and for which we are most sincerely grateful. In voting, we express our passions and the deepest concerns of our hearts. Vote for the love of what you love. If we value living in a democracy, then getting ourselves to the voting booth whenever the opportunity arises is the chance to do our part in saying that democracy actually matters. Participation matters. Showing up for our beliefs matters. Taking a stand matters. No matter how broken our systems may seem, voting is a better way to address the need for change than not voting. Voting activates and engages us. Let’s raise our individual and collective voices in a hopeful, loving chorus that drowns out efforts to silence any of us. So, let’s love what there is to love. Let’s show up with fierce hearts and with profound regard for ourselves and each other, our ancestors and future generations. Let’s raise our individual and collective voices in a hopeful, loving chorus that drowns out efforts to silence or erase any of us. Color in a circle on a piece of paper. Pull a lever. Push a button. No matter how you cast your vote, cast it. With the power of casting one starfish back into the ocean, let the world feel the power of one, the power of many, the power of you. NOTE: Kristi wants to suggest the practice of sending the images above as eCards to people around the country you want to encourage to vote. As Br. David always says, let’s “DO something” with the opportunities available to us. Thanks. I can’t vote in the USA because I am a ‘legal alien resident’ and not a US citizen yet, although I have applied for my US Citizenship but it takes many months to go through this process. I can’t vote in the country I was born and raised in, (Canada) because I no longer live there. What I would like to vote for is: World Peace. Why do we allow politics and borders divide us? Why don’t we all (7 billion of us) living on this precious planet Earth work together in love and compassion, instead of spending so much energy and money on political campaigns? We (all of us Earthlings) would have a lot more freedom, if we vote to work together for peace. The morning after the elections: No doubt we all have things we will celebrate and grieve as the results have come in. If we are called to show our love by voting, then we are called to continue showing love by how we engage with the world to which we now awaken. How will we interact? What will we do? Where do we put our energies? How can we offer healing to this hurting, divided world? May we turn to love again and again for guidance. To love is to listen. What would love do? Yes, yes, yes! This is the very power of radical grateful living. As Paul Tillich said, “The first duty of love is to listen.” As an Aussie many of us recognise the significance that American politics has on the world as a whole. I recently listened to Deeyah Khan in an interview with Russell Brand on the fundamentally shared traits of those caught up in extreme fundamentalism but also with us all as human beings. Acceptance seemed to be, according to Khan and others, the central shared motivation for all. More than anything, listening and understanding is number one. What is it that unites us all as human beings on the most fundamental levels of which politics is secondary? I watched as the initial confidence of a “Blue Wave” slowly turned to a trickle and the disappointment of witnessing, on both sides, that the divide is still very much alive. But on the positive side, what a massive turn out in voting from both sides! The energy was greatly different to two years ago. It seems that the American population, while still seemingly very divided (as is a lot of the world) have had a fire lit under them. There is common ground to be found. Perhaps a refocus on grass roots? Thank you Craigus. I have that Paul Tillich quote sitting on my bedside table, a constant reminder of that responsibility that too often gets put aside. Thank you, Kristi, for your impassioned effort to ‘get out the vote’ and for this inspiring footnote. I will keep walking the shore and casting starfish back into the ocean. Every day I will look for these opportunities. The day before election day, which is like no other that I can remember, you have given a whole new context to this time. Voting is Love. A most helpful prism to BE right now. Thank you Missy. I am so glad to be able to see love as the way to channel my passions at this political moment. And I am glad this helps as a way to BE. Thank you for this expanded perspective on the importance of voting. In this time, it seems like voting has become a game of winning at any cost, taking control, and feeling justified and “right”. I feel encouraged that in my state that participation in early voting has been very high and I hope that this momemtum will carry through tomorrow. The right to vote can’t be taken for granted. Dear Kristi, yes, yes voting is such a privilege!!! You have worded your reflection so beautifully and brought out points that can be overlooked. Thank-you so much for sharing this!!! May we bless all the candidates, that they may be guided to make all their decisions that are in the highest good for ALL LIFE everywhere. God bless you, dear Kristi.